Advances in technology aren’t always what they seem. Take, for example, Gillette’s latest “breakthrough” in shaving tech — a heating mechanism that complements the razors that are already packed with blades. It’s as if Gillette, upon realizing that it would be physically impossible (or even more worthy of parody than their previous efforts) to cram more blades onto their razors, is desperate to see what other “innovations” they can add to a single cartridge. But neither the heating element nor the extra blades seem to add much to the shaving experience, as evidenced by the fact that more consumers than ever are turning toward traditional, simple razors — even straight razors — instead of the high-tech, feature-burdened razors born of the modern era. Sometimes, what seems to be a breakthrough ends up complicating our lives unnecessarily, or making a task harder (instead of easier), oftentimes costing more money in the process. The shaving industry is hardly alone in this — it just happens to be one of the best examples. Gillette has been a leading pioneer in the shaving world, though evidence suggests their “breakthroughs” only add a slight benefit to the overall shaving experience. The double-edged safety blade was introduced in 1901, but after Gillette’s patent expired, it began to lose market share to competitors. They introduced 2-bladed and 3-bladed razors shortly after, both to offer something different from the competition and to make more money from consumers buying replacement cartridges — and it was a very successful strategy. In the years that followed, Gillette continued to pack more features onto their blades, raising their profitability while simultaneously encouraging more sales and shutting down the competition. They introduced 4-bladed and 5-bladed razors, along with lubricating strips and wear indicators, and seemed to come out with a new innovation every few years — to the point where they were more commonly mocked than celebrated in pop culture. The whole point of extra blades and extra features, so we are to believe, is that the extra blades reduce the pressure on your face, resulting in a more comfortable and/or closer shave. Yet evidence suggests there is only a slight benefit to adding a second blade on a razor, and there is virtually no benefit in having three or more. It’s as if razor companies have mastered the art of appearing like there’s a measurable improvement in the overall razor experience, without actually improving it. In fact, most dermatologists recommend a single- or double-blade shaving experience, since the additional blades tend to result in more nicks on the skin, and create a slight rounding effect on the skin, which leads to more irritation when running additional blades over it. This hasn’t seemed to slow down the push for more innovation, as evidenced by the brand’s recent foray into heated blades. We’re getting bigger, sexier, more feature-packed razors, when in reality, it’s just taking us further from the ideal — a single- or double-bladed, simple shaving experience. That’s why nimble startups will always have the potential to disrupt their bigger competitors, despite a lack of abundant resources; many times, a simple, effective product is better than a fleet of high-tech products that were invented mostly for show. It’s also important to note the complex effects of introducing more choices for consumers. In a society driven so heavily by individual freedom and personal choice, it would seem like more choices is always better — yet this doesn’t appear to be the case. Instead, making a choice between two or three options is relatively easy, while staring down dozens of choices merely gives us analysis paralysis. The more variables there are to consider, and the more options are on the table, the longer it’s going to take you to come to a rational decision, and the more unsatisfied you’ll likely be with your final choice — since there were so many alternatives that could have hypothetically been better. This is perhaps best exemplified by the sauce-making approach taken by Prego in the late 1980s. Desperate to offer newer, better options than the competition, Prego started researching new potential sauces, ultimately making 45 varieties that differed based on dozens of variables, including spiciness, sweetness, tartness, aroma, mouthfeel, thickness, saltiness, and more. After studying consumer reactions, they learned that every consumer liked something a little bit different, but ultimately, they fell into three broad categories: people who liked plain, people who liked theirs spicy, and people who liked theirs extra-chunky. Those three options presented enough variety to give consumers something they wanted, without bombarding them with dozens of possibilities. In the shaving industry, brands like Gillette have gone the bombardment route. There are practically limitless styles and features of razor blades to choose from, and they keep making things more complicated whenever they introduce the “latest and greatest” in shaving tech. But at the end of the day, consumers can feel better about their choices when they only have to decide between the basics; do they want a “high tech” razor, packed with extras and priced at a premium, or the basic razor that’s worked effectively for more than a century? Increasingly, they’re choosing the latter. Gillette and other major razor brands have plenty of access to consumer data and data on shaving outcomes to understand that single- or double-bladed razors are arguably a better choice, both for profitability and for consumers’ overall shaving experience. So why are they continuing to offer high-tech upgrades? Part of the issue boils down to brand differentiation and consumer perceptions — dilemmas that most industries have to deal with. In the world of single- and double-bladed razors, there aren’t many options for distinguishing yourself. Strangely enough, it’s easier to invent something new than it is to repackage something familiar, and that string of inventions makes it seem like the brand offering them is the leader in their industry. If Gillette is the only brand introducing this many new varieties of razor blades, most consumers will take that at face value, assuming that it’s because Gillette is the only one making technological progress — even if that “progress” results in an inferior shaving experience, or a more stressful consumer purchasing decision. Of course, introducing new models isn’t the only way to boost a brand’s image in a competitive market. 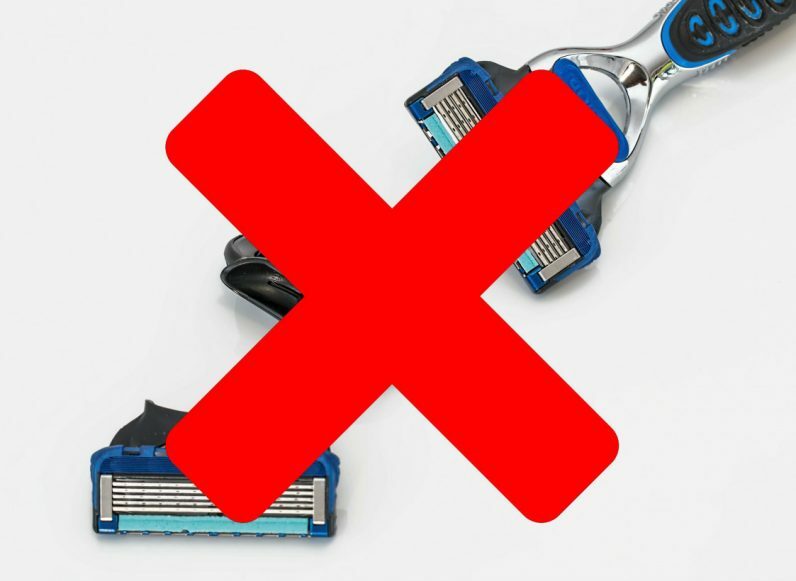 Gillette has also demonstrated a capacity to mimic competitors it feels threatened by, rather than responding with innovations of its own; for example, after Dollar Shave Club became popular with consumers, Gillette attempted to launch its own online blade delivery service. Though there’s certainly an addition of value here, it’s driven more by a desperate desire to appear new and innovative than a genuine desire to introduce something better. Gillette and the razor blade industry are hardly alone in their desire to offer newer, better models on a constant basis. Most tech companies have faced the same type of criticism in one realm or another — like how Apple is criticized for offering new iPhone models year after year, with the only innovations being “window dressings” that add little to no real benefits. It’s easy to get caught up in the idea that more features or new presentations automatically equate to a better product, and that more product choices means you’ll find a better match for your needs. But sometimes, the latest tech advancements are actually a step back — and the simple products we used initially are just as good or better.